Our showrooms currently include 3 Matki cubicles . 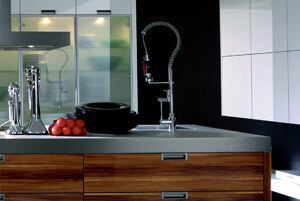 We offer a wide range of Appliances & Sinktops. 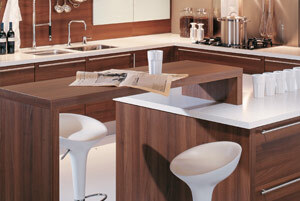 We specialise in BOSCH appliances, and Blanco sinktops and both are heavily featured in our extensive Kitchen Showrooms. We offer excellent prices and pride ourselves on an extremely high level of service. 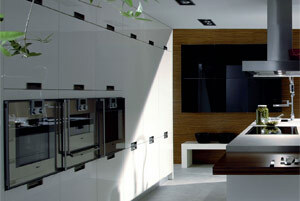 PRONORM - German made, rigid assembled Kitchen Furniture - featuring 3 ranges: ClassicLine, ProLine and Y-Line. Futuristic, Modern Designs combining fantastic levels of quality with economical prices - making prestige product available to everyone. CLASSICLINE - Whether compact concepts or spacious open-plan solutions, classic ambience or modern trends - ClassicLine guarantees design flexibility with its intelligent fittings and a wide selection of colours and materials. Discover the creative side of the new style of living. PROLINE - Our grid planning system has convincing answers to all your furnishing questions and wishes. Combined with various plinth heights, the system's 128mm grid spacing can be used to produce any height you wish. 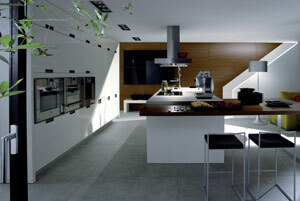 Perfectly planned and tailored to your needs, your Kitchen becomes a beautiful space for cooking and living in. Worksurfaces that are made to last, man-made or naturally occuring materials, enviromentally friendly products, made-to-measure - written quotations including on-site templating and installation upon request.